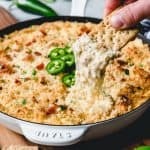 This creamy, cheesy Jalapeno Popper Dip with Bacon is the ultimate appetizer indulgence! So warm and comforting and perfect for parties! Cook the bacon, then chop or crumble. Set aside 2-3 tablespoons for topping. Preheat oven to 350 degrees F.
In a large bowl, blend the cream cheese with the sour cream and mayonnaise until smooth using a hand mixer. Stir in the chopped jalapeno, crumbled bacon, garlic powder, smoked paprika, pepper, and salt. Add the cheese and stir to combine, then pour into a 10-inch skillet or square baking dish, spreading into an even layer. In a small bowl, combine the panko breadcrumbs with the melted butter and Parmesan cheese, tossing with a fork to coat the breadcrumbs. Sprinkle over the top of the dip. Bake for 20 to 25 minutes until the breadcrumbs are lightly browned and the dip is hot all the way through. Remove from the oven and sprinkle with the reserved bacon and chopped fresh parsley, topping with additional fresh sliced jalapenos, if desired. Serve hot with crackers, chips, or veggies for dipping.